Does my company already have access? The only data solution that comprehensively tracks people, projects, and companies across television, film, and digital entertainment. Variety Insight is the leading entertainment data solution that provides verified, timely, and accurate metadata around people, projects, and companies that work in the global entertainment business. You can rely on Variety Insight to ensure your organization makes informed business decisions based on the most up-to-date information available. Built on cutting-edge technology and designed on the most user-friendly interface, clients get what they need quickly and easily. Powerful enough to serve the titans of the entertainment industry, Variety Insight is affordable enough for many small and midsize players, too. Variety Insight plays well across all platforms and devices, allowing you to access information when and how you need it. Variety Insight tracks all phases and stages of the entertainment industry. Variety Insight is the research tool that benefits your entire organization. Knowing the competition is your business. You have the vision to do even more, and you know that reliable information is power. Your team needs to know what's been bought in the marketplace, and loves tools that keep you ahead of your favorite writers, producers, directors, and stars. You have to ensure your new and returning series have the legs to survive. Strengthen your bench by building the smartest and fastest lists for talent, directors, and staffing. Your team needs lead lists before your competitors. Find out what's happening first. You support organizations that too often try to make decisions based on gut feel and seat of your pants thinking. Get the data and tools you need to move your colleagues in the right direction. You feel good when you have more information than those negotiating the other side of the deal. Variety Insight cuts through the noise and reveals the true value of a new pitch, project, or producer. You win by empowering your team with the most efficient tools to identify the best new and existing TV, film, and digital entertainment. You want proof that your organization is leading in the marketplace. You need to know what projects are poised for a greenlight, as well as what's prepping, shooting, and in post. 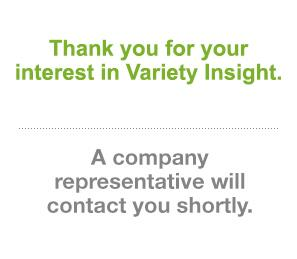 Variety Insight is the original digital native data partner to the entertainment industry. The most trusted data source since 1999, it serves over 650 leading entertainment companies, technology providers, and brands. × Does my company already have access? © Copyright 2019 Penske Business media, LLC. All rights reservered.